Two images from a pamphlet titled Dhikrá istiqlāl Sūriyā also sent along to us by Zach Foster. 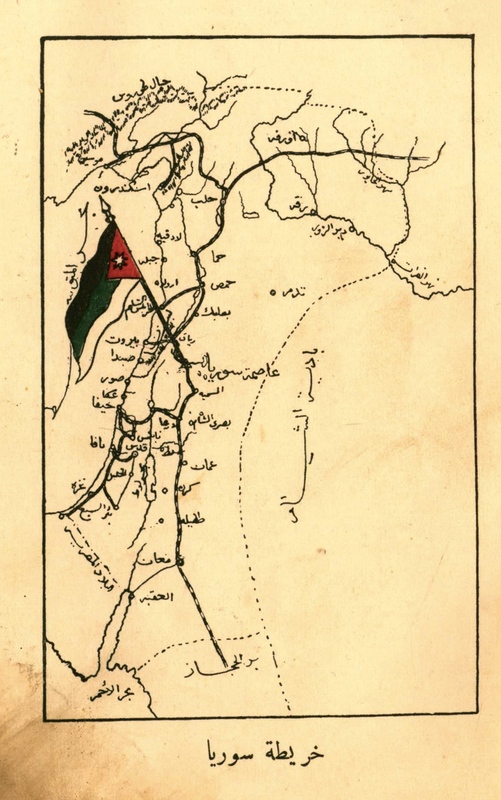 The first shows Faisal, best known as king of Iraq, and the second shows the territory he claimed in 1920 as part of his short-lived Arab Kingdom based in Damascus. Faysal ruled Damascus beginning in October 1918 and ending in July 1920, though he only declared himself King four months before the end. 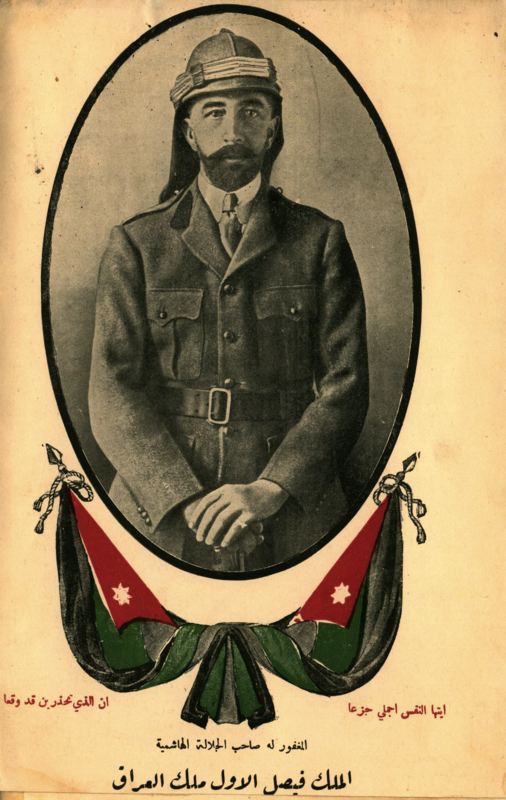 The French army refused to allow the creation of Faisal's Syrian kingdom, defeating a small contingent of Faisal's forces at the battle of Mysalun. Faisal was given Iraq as a consolation prize by the British, which his successors ruled until 1958 when they were ousted by a coup. Had Faisal's dream of a free Arab kingdom become reality, the Middle East might have been spared many of the conflicts it endured over the past century. Or maybe it still would have seen conflicts between the Arab Kingdom and its Christian minority, Kurdish minority and Zionist minority. Or between the Arab Kingdom and the Republic of Turkey. Or Iraq. Or Egypt. As Zach points out, even during his glorious short lived period of rule he struggled to convince others outside of damascus to subject themselves to his rule. James Gelvin's Divided Loyalties (p. 30) even reports that delegation of Aleppan notables used the occasion of Faisal's coronation to demand independence for their region. Suffice it to say this did not bode well for his future prospects of ruling all of Syria, let alone Syria, Lebanon, Jordan and Palestine. And Cartoon Arabs in the Turkish Press.